Can you see the tiny tips of the shoots. They’re much bigger now! Categories: .... on growing your own, .... on saving seed | Tags: Food, gardening, germination, grow your own, seed saving, sweet corn, vegetable gardening, vegetables | Permalink. Self saved carrot and sweetcorn seed, rehydrating. Categories: .... on growing your own, .... on saving seed | Tags: carrot seed, Food, gardening, germination, grow your own, sweetcorn seed, vegetable gardening, vegetables | Permalink. The seed has formed but the flower head isn’t ready for harvesting yet. Around about this time last year, on the advice of a friend, I replanted the tops of three carrots I had earlier pulled from my garden and prepared to go with tea. The whole purpose of the exercise was to try and regrow the tops, to produce home grown seed for subsequent seasons. 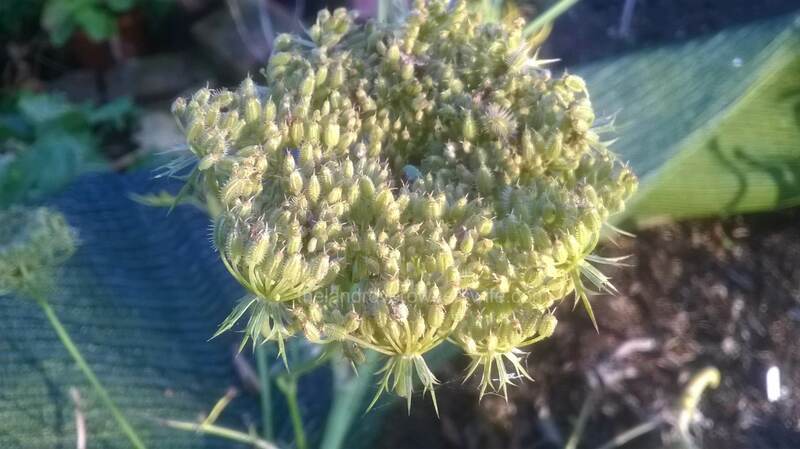 As carrots flower during their second season, I either had to leave a couple of roots from the 2013 carrot crop in the bed for flowering this year (not my preferred option as I hadn’t got many carrots to start with) or try this method. If you decide to attempt to grow seed from just the carrot tops, it is important to remember to leave the leaves attached and not to chop them off during food prep’. You must also remember leave at least 1 inch of actual carrot attached to the leaves, to give your carrot tops the best chance of rooting. 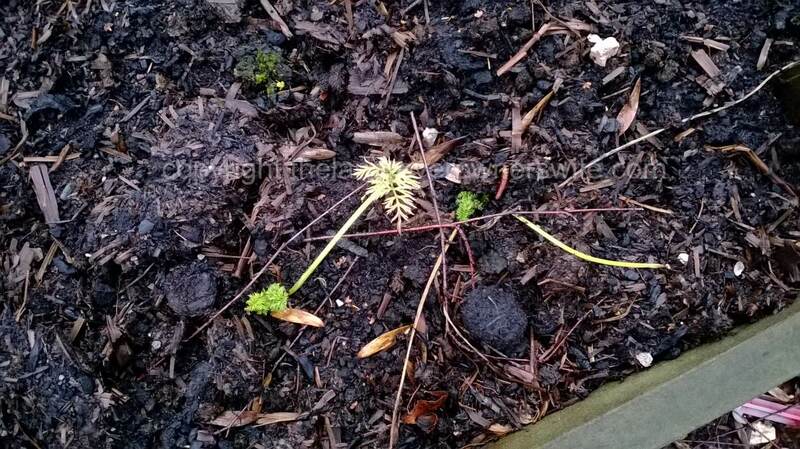 Details of the progress of my carrot top plantings can be found here. Categories: .... on saving seed | Tags: carrot tops, Food, Giant Red Carrot, grow your own, seed saving, vegetable gardening, vegetables | Permalink. 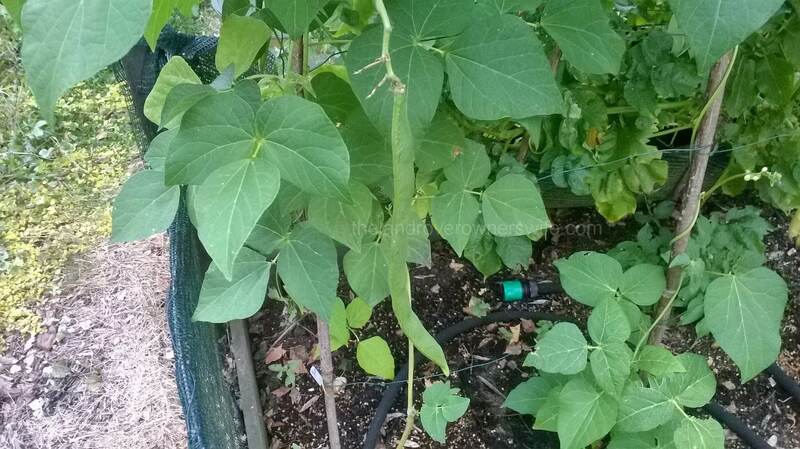 Another of the most exciting events of this years growing season was when the Cherokee Trail of Tears Pole Bean seeds I saved last year, germinated and grew a few strong plants, although quite a lot more failed to appear at all. I suspect this was due to the fact that I had waited to later on in the season before selecting pods to dry out which meant that the plants were tired and the seeds weren’t as healthy as they could have been. This year I let some of the first pods go to seed and the end result has been worth it with a lovely crop of healthy looking black seeds to store for next year. As with the Runner beans, later in the season my excitement knew no bounds when I saw the first flower and the sense of achievement I felt when I spotted the first tiny bean was huge. Categories: .... on growing your own, .... on saving seed | Tags: Cherokee Trail of Tears Pole Beans, Food, grow your own, seed saving, vegetable gardening, vegetables | Permalink. One of the most exciting events of this years growing season was when the Czar Runner Bean seeds I saved last year germinated and grew strong plants. Later in the season my excitement knew no bounds when I saw the first flower and the sense of achievement I felt when I spotted the first tiny runner bean was huge. 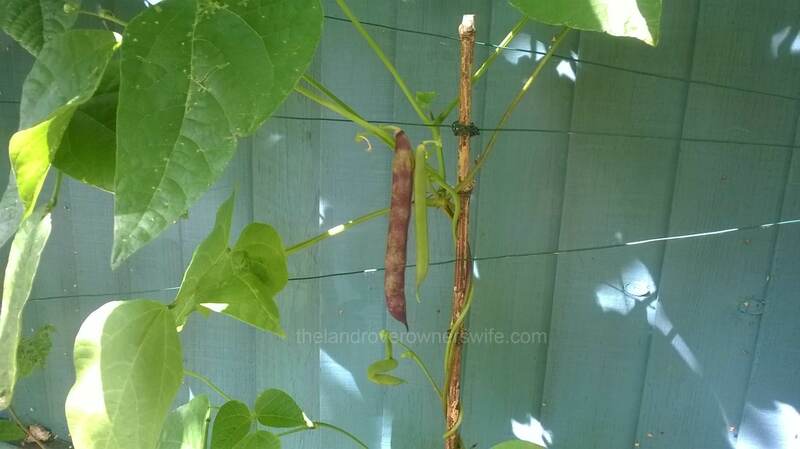 With the plants at their healthiest, some of those first runner beans were left on the plants to ripen and form the seed for next seasons bean crop. Categories: .... on saving seed | Tags: Czar runner bean, Food, grow your own, seed saving, vegetable gardening, vegetables | Permalink. A lovely number of seeds but only time will tell if they are viable. For three days I left the seeds to ferment, waiting for the seeds to separate off from the gunk and float to the bottom of the jar if good or to the top if bad. The instructions from the Real Seeds Catalogue page were very specific on the amount of time the seeds were to be left in the water: 3 days – no more no less. Another source reckoned that by now a horrible scum would have formed on top and that this needed to be carefully scooped off and disposed off. Well my seeds didn’t have any scum and all the seeds had pretty much sunk to the bottom of the jar, so I was not entirely sure that this stage of the seed saving had worked but I decided to carry on to the next stage anyway. I will be saving seeds from another outdoor grown tomato and it will be interesting to see if the reaction is any different. Categories: .... on saving seed | Tags: Food, grow your own, seed saving, Stupice tomatoes, tomatoes, vegetable gardening, vegetables | Permalink. Tucked into the corner of the small greenhouse, I spied a perfectly formed, beautifully red, medium sized tomato. Not too big and blemish free it was the ideal candidate for seed saving. There is a very small chance that cross pollination may have occurred but the location of this particular fruit and the self-pollinating nature of tomatoes, has, in my opinion, minimised the risk and so I have decided to save the seeds from this perfect fruit. 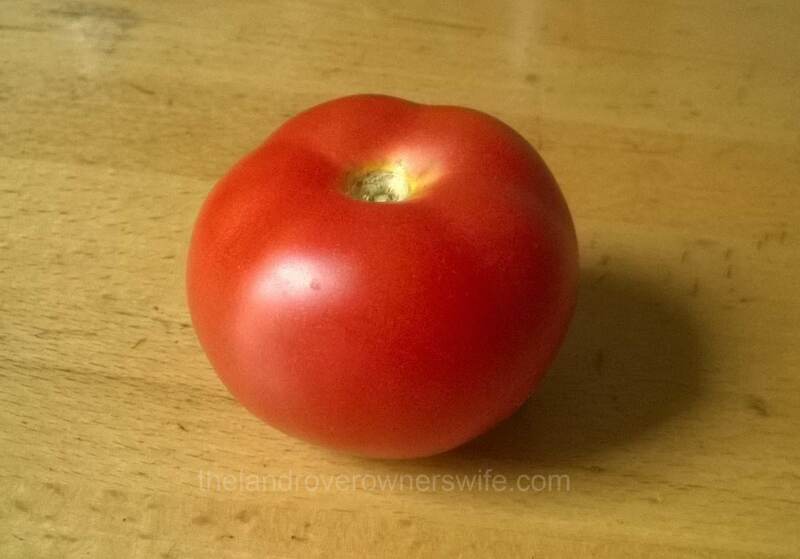 I will also save the seeds from one of the outside fruits too but this tomato really was too good to eat …. well the seeds were (the flesh was quickly devoured by the Mudlets). Hung up to dry out: the hopes of next season rest on this cob. One of my goals with the vegetable patch is it be able to cut back on the yearly purchase of numerous packets of seeds by saving, wherever possible, seed from my own produce from which I can grow the following seasons crops. The fact that the type of seed I was buying might be the cause of some of the failures in my garden, was something that only dawned on me, slowly, over several seasons. 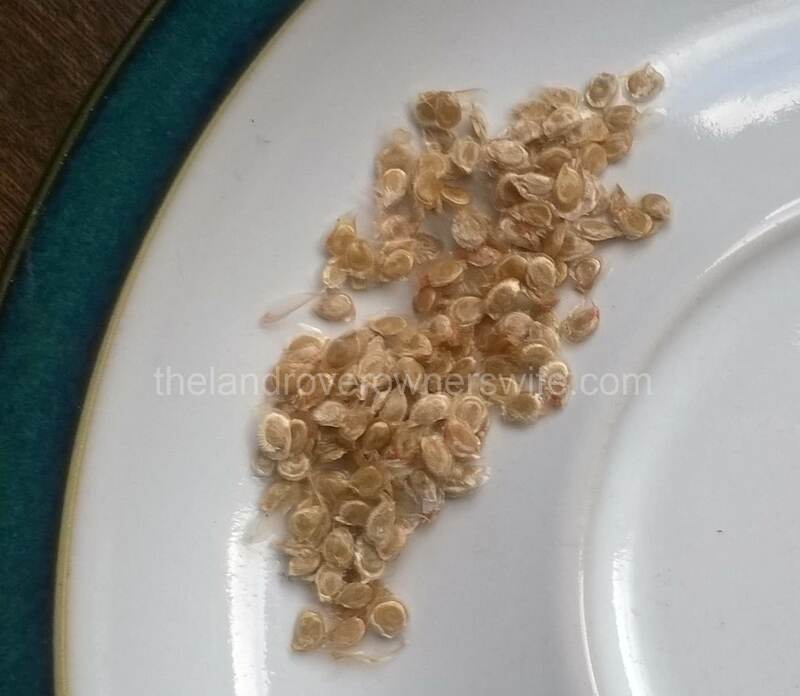 In fact it wasn’t until I stumbled upon a reference to a seed bank and the importance and benefits of seed saving, that I began to consider the inherent difficulties of using the ‘one size fits all’ seed, that is available in garden centres and seed catalogues. Categories: .... on growing your own, .... on saving seed | Tags: Food, grow your own, saved seed, Sweet corn Special Swiss, vegetable gardening, vegetables | Permalink. This particular post is an account of my attempt to grow carrots for seed. Last year (2013) I obtained some Giant Red Carrot seed from The Real Seed Catalogue, initially to grow for food but with the long term aim of being able to save my own seed for use in future years. Carrots flower in their second year and so the method for seed saving detailed on the Real Seed website was to leave two or three carrots in the bed, as these would die back over winter, then grow back this spring, would eventually flower, producing seed which could then be collected. Categories: .... on growing your own, .... on saving seed | Tags: carrots, Food, grow your own, seed saving, seeds, vegetable gardening, vegetables | Permalink.